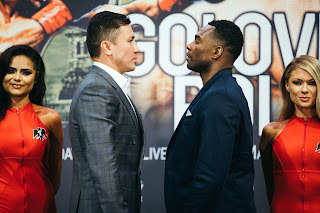 The official weigh-in for Premier Boxing Champions latest card, which will be televised in the United States by Showtime and will be headlined by a twelve round Jr. Welterweight bout between former multi-division world champions Mikey Garcia and Adrien Broner took place earlier today in Brooklyn, NY. The official weights for the entire card are as follows. Main Event: Jr. Welterweight – 12Rds. Mikey Garcia 139 1/2lbs. vs. Adrien Broner 138 3/4lbs. Jermall Charlo 159 1/4lbs. vs. Jorge Heiland 158 1/4lbs. Rau’shee Warren 113 1/4lbs. vs. McJoe Arroyo 114 3/4lbs. Katie Taylor 134 1/2lbs. vs. Jasmine Clarkson 133 1/2lbs. Noel Murphy 142 1/4lbs. vs. Julio Cesar Sanchez 143lbs. Gerald Washington 248lbs. vs. Jarrell Miller 298 3/4lbs. Billy Dib 133lbs. vs. Yardley Cruz 132 3/4lbs. Kenny Robles 140 1/2lbs. vs. Dan Murray 143 1/2lbs. Desmond Jarman 129lbs. vs. Darnell Pettis 130 3/4lbs. Elder Hernandez 222lbs. vs. George Arias 213 1/4lbs. PBC: Garcia vs. Broner takes place tomorrow night (Saturday, July 29th) at the Barclays Center in Brooklyn, NY. The card can be seen in the United States on Showtime beginning at 9PM ET/6PM PT and will also be streamed on the Showtime and Showtime Anytime apps. Check your cable/satellite listings for time and channel in your area. A portion of the undercard headlined by the Gerald Washington-Jarrell Miller bout will be streamed on Showtime Sports’ Facebook page and Youtube channel beginning at 7:15PM ET/4:15PM PT. For more information on the undercard stream, Showtime, Showtime Sports, and the Showtime and Showtime Anytime apps and a list of compatible devices please visit: www.sho.com. Showtime Sports’ Facebook pages: www.facebook.com/ShoBoxing / www.facebook.com/Shosports Showtime Sports’ Youtube Channel: www.youtube.com/user/shosports. In the United Kingdom and Ireland the card can be seen on Sky Sports Main Event (Formerly Sky Sports 1) beginning at 1AM (Sunday, July 30th) at 1AM (Local UK Time) For more information on Sky Sports and to check channel listings in your area please visit: www.skysports.com.